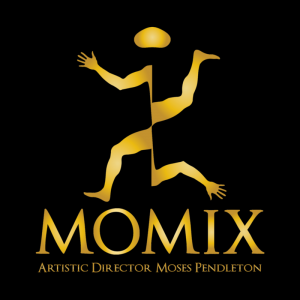 Wherever Moses Pendleton takes his internationally acclaimed dance troupe MOMIX praise follows. “Moses Pendleton and the entire company are notorious for consistently creating complex, dizzying universes and inviting the audience to join their new realities. And one thing is certain: Every ride is an incredible, unforgettable journey,” Broadway World said in reviewing a June performance of “Opus Cactus” at The Joyce Theater in New York City. Pendleton, the founder and artistic director of MOMIX, his wife, Cynthia Quinn, the associate director, and the entire company also focus each summer on combating the opposite of beauty—by presenting MOMIX in the Garden, a private performance benefit event for the Torrington-based Susan B. Anthony Project. The nonprofit organization promotes safety, healing and growth for all survivors of domestic and sexual abuse, and advocates for the autonomy of women and the end of interpersonal violence. Cramer & Anderson is a Gold Sponsor of MOMIX in the Garden for a second year in a row, and also was a sponsor of the 2015 event at a different level. “We’re committed to the Susan B. Anthony Project and committed to expanding support for the arts in Litchfield County,” said Attorney Neal D. White, Jr., a Partner in the firm’s Litchfield office whose practice focuses on Estate Planning & Trust Administration, Real Estate Law, Business & Commercial Law, and Tax Law. Guests at MOMIX in the Garden are treated to wine, hors d’oeuvres and a breathtaking private performance in the beautiful gardens of a different host home each year, according to the event page on the Susan B. Anthony website. Tickets are $150 per person. The 9th annual performance of excerpts from the MOMIX season is scheduled for 5 to 8 p.m. on Saturday, Aug. 19, at the Litchfield home of hosts Grace & Djan Yagtug. They’re fairly new residents of the area and supporters of the Susan B. Anthony Project. Djan Yagtug also serves on the board of Five Points Gallery in Torrington, where a new Biennial Juried Exhibit opened in early August and runs through Sept. 2. The gallery is donating 10 percent of its commission on all sold work to the Susan B. Anthony Project. More than 200 guests attend MOMIX in the Garden each year. Tickets may be purchased online, and will be available until the day before the performance. “It really is a beautiful community event. People are going to have a wonderful time,” said Gina Devaux, Director of Development for the Susan B. Anthony Project. “Cynthia and Moses of MOMIX donate the performance to us every year, which allows us to get all of these great sponsors on board,” explained Ms. Devaux, who expressed deep appreciation for the number and caliber of community partners that support MOMIX in the Garden. 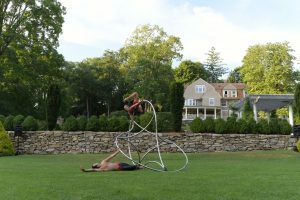 In one way, the event brings together businesses, nonprofits and individuals with shared values and shared connections emerging from the workplace, the arts and the sense of community in Litchfield County. “We all work together. We try to help each other out,” Ms. Devaux said. The Susan B. Anthony Project, named after the 19th century abolitionist, labor reform advocate and champion for women’s right to vote, provides emergency shelter, transitional housing and services, counseling, support groups, court and medical advocacy, child and teen advocacy, and community education that even extends to puppet shows for children in preschool. All of those efforts are making a significant impact—to the point that demand for the Susan B. Anthony Project’s services is increasing. As the Susan B. Anthony Projects choreographs its suite of services in response to ongoing societal problems, the help it gets through the artistic choreography of one of the world’s top dance troops is invaluable—and what MOMIX in the Garden guests enjoy will be incomparable. “Pendleton combines his muscularly sculpted dancers with unique costumes and props, sets them amongst artfully created lighting and light effects, and finally completes everything with a personally selected diverse musical score, ranging from Vivaldi to New Age to birdsong… ,” the MOMIX website says. See that website and the Susan B. Anthony event page for a taste of what you’ll see on Aug. 19, and click through to order tickets. Cramer & Anderson has offices in Litchfield, New Milford, Danbury, Kent, and Washington Depot. For more information, see the website at crameranderson.com, call the New Milford office at (860) 355-2631, or call the Litchfield office at (860) 567-8718.